We don’t need to remind you that Valentine’s Day is just around the corner, do we? And in the spirit of the season, we just couldn’t help ourselves from cooking with chocolate ! Now we all know how versatile chocolate and cocoa can be in baked goods – but before cookies and cupcakes, savory applications ruled the cocoa kingdom. Beyond Spanish-speaking chihuahuas, Mexico’s claim to fame in the culinary world was the creation of some of the most complex and sophisticated sauces. Mole, a staple of major celebrations in Central Mexico, is by far one of the most representative of said sauces. While some Mole recipes call for simmering upwards of 40 ingredients for several hours, the real key to making an outstanding Mole is finding the perfect balance of sweet and savory that promises incredible depth of flavour. As for Mole’s star ingredients (ancho chilies and dark chocolate), they certainly didn’t make their way into the sauce by accident. 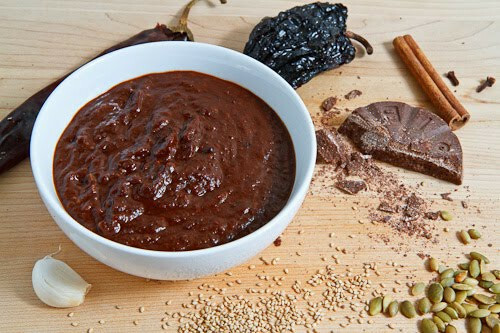 The pectin released from chilies when exposed to heat creates Mole’s distinctive thick mouth feel while the chocolate adds richness and structure to the entire sauce without being overpowering. Step 1 Add 2 teaspoons of olive oil to a small pot and heat on medium until hot. Add the minced garlic, shallot and white parts of the sliced scallions. Cook, stirring frequently, 30 seconds to 1 minute, or until fragrant. Step 2 Stir in the tomato paste and cook 3 to 4 minutes, or until caramelized, stirring and scraping the bottom of the pot frequently. Step 3 Stir in the raisins, chopped chocolate, Mole spice blend and 1½ cups of water into the mole sauce and season with a pinch of salt. Reduce the heat to low and simmer, stirring occasionally, 5 to 7 minutes, or until the sauce is slightly reduced in volume and the flavors have melded. Stir in a squeeze of lime right before serving. Enjoy !